4/9/2009 — Thursday’s ride began with disappointment. Even with my buzzer switch installed, my starting issue persists. No time to fix it though, I had places to go and people to meet. I rode familiar roads to western Bloomington to meet with a professional staffing agency about some job possibilities. Having mapped the route beforehand, I found an easy, low traffic street that looked like it ought to get me where I needed to go. The street I needed was right off my old commute route. 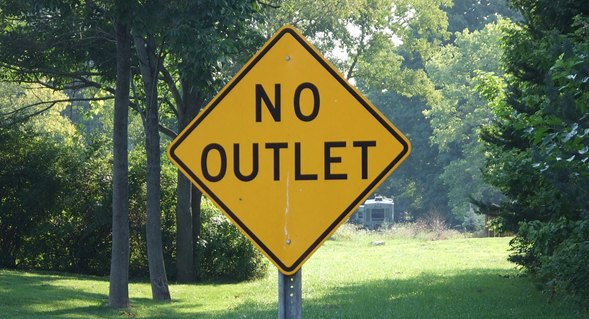 However, when the turn for Telegraph Rd came, the big yellow sign said “NO OUTLET.” On Google Maps, the street was continuous, but the sign won in the end. To get where I needed to go, I had to actually take about 15 ft of sidewalk and hop down the curb. Not exactly legal, but I blame Google. With the windshield removed, the GT was a whole new scooter. Even though I prefer to take my torso out of the wind, the way my Vespa handled and felt without the windshield was like falling in love with the bike all over again. Also, I felt extra industrious and mechanical in replacing the valve cores in both tires as a preventative measure to hopefully keep my previous adventure in spontaneous rear tire deflation from happening again. I don’t often hop down street curbs from the sidewalks (do you?) and when I did it this time, I did it wrong. I gave it too much throttle while trying to ease the rear wheel down. I was afraid the rear fender would hit the curb. Let’s just say it wasn’t graceful. Also, I am still no closer to figuring out where my battery draw is coming from or what other factor may be causing my starting issue. It’s not a huge worry — hasn’t left me stranded or anything…yet.